We’ve all seen videos or articles that have gone ridiculously viral, continuing to be circulated widely even months after their initial appearances. There’s no science behind creating a viral post, and no guaranteed recipe or checklist. However, there are certain characteristics all viral posts share which make people want to spread the word within their networks. Here we explore a couple of attributes you should aim to include in your posts to increase your chances of being shared. A great starting point is simply paying more attention and observing your own liking or sharing behaviour across social media platforms. One common characteristic of most viral content is its relevance to current events. Regardless of your topic, you’re likely to get more shares if your content is relevant to what people are already actively searching for or talking about at that moment. Publishing up to date content greatly increases your visibility, which is the first step to going viral. A great way to keep track of the most popular topics is to keep an eye on Twitter. Trending topics and hashtags are constantly changing according to what users are talking about most, and this is often the first platform people use to share news. John Oliver’s satirical news show, ‘Last Week Tonight with John Oliver’, is famously known for its commentary on current affairs and have resulted in several incredibly viral videos on social media sites like YouTube and Facebook. The key to publishing any content is to ensure you’re targeting the right audience. This is especially important if you want your posts to go viral. Find out what your viewers’ preferences are, what they want to see, and the kind of posts they’ve historically taken an instant liking to. Designing your posts to appeal to a specific demographic establishes a personal connection with your viewers, which makes them want to keep reading or watching. People are much more likely to share posts that resonate with them and that they can relate to – this can’t be achieved with general and vague posts. Once you’ve established your target audience, find a way to engage them. Boring content not only reduces the interest of your audience, but also ensures they won’t share it with their friends. The most viral posts are ones that elicit strong emotions in viewers, compelling them to take action. Any kind of strong emotion incited by your post leaves an impact on your viewers and makes it memorable. A good starting point is to consider the 6 basic emotions – anger, fear, surprise, disgust, happiness and sadness. Does your content inspire any of these emotions? While content that connects emotionally with audience has a higher chance of being shared, it’s usually the positive type that goes more viral. Content that’s humorous or touching in particular often makes up the largest proportion of viral posts. When people come across something that adds value, even if all it does is make them feel more positive, they are likely to want to introduce this to their network. Air New Zealand’s Hobbit-inspired safety briefing is a great example of connecting with viewers and audience. When trying to make a post go viral, it’s often good practice to ask how your content adds value to your viewers. People also like to look good on social media, so if sharing your post makes them feel like they’re imparting some useful knowledge to their peers and connections, chances are that they’re more likely to do so. A great way to capture your audience’s attention right from the start is to ensure your headlines are clear and compelling enough. It’s not enough to simply have useful content – constant checks to ensure you’ve established and are maintaining that emotional connection with your viewers can help create a potentially viral post. Text posts make up a very insignificant proportion of viral posts – attractive visuals are critical in engaging your viewers and increasing the value of your post. No matter what social media platform(s) you’re utilising, simply adding a couple of relevant images not only increases your chances of getting clicked on but also being shared. Videos are an even more powerful tool of communicating your message to your audience with a personal touch. Videos arouse greater emotion and resonance with viewers, and especially if utilised effectively in telling a story, for example. Exploring different forms of content is critical in creating a viral post, particularly to stay ahead of the ever-decreasing attention spans of people on social media. One great example is the public service announcement campaign by Melbourne’s Metro Trains – the “Dumb Ways To Die” video was viewed 30 million times within two weeks of its upload. Timing is essential for making posts go viral and can make all the difference in terms of being seen by your audience. For example, it’s a well-known fact by now that most people generally follow similar trends of social media usage throughout the day. Majority of Australians are most active on social media first thing in the morning as well as in the evenings. Posting content at a time when people are likely to be at work or asleep drastically decreases your chances of being seen, let alone shared. On the other hand, posting about large events, for example, which are being covered by multiple media channels and being excessively talked about can result in your post being lost in the barrage of others. Many social media platforms have tools which enable you to study the viewing patterns of your visitors. Utilising them effectively can help you plan the timing of your next potentially viral post. Many viral posts owe their success and position in the limelight to being shared by high-profile users with large follower bases. Constantly bombarding them with messages and requests to share your post is not an ideal way of gaining fame; you may end up blocked for being a spammer. The best way to get yourself on the radar of an influencer is to attempt to build a connection with them. This can be done by sharing their posts, recommending them to your own followers, and attempting to start a conversation with them. This does not guarantee they will respond, but it’s likely that this may catch their attention, encourage them to check out your content, and even share your posts without having to be asked. 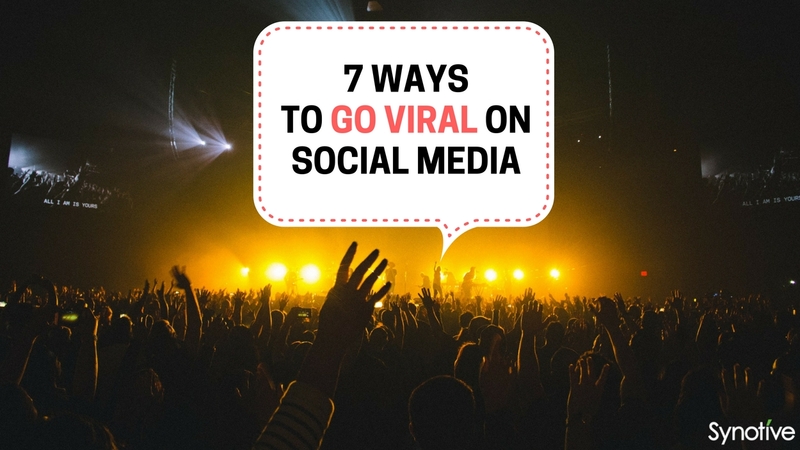 At the end of the day, creating viral posts can often come down to plain luck – being discovered at the right time by the right people can propel your post to instant online fame. That being said, ensuring your posts follow the elements discussed here most definitely increases your chances of being discovered and shared among your audience. If you’d like to learn more about how engaging content and social media marketing can strengthen your online presence, get in touch and we’ll show you how!